Combining 3D printing, VFX / CGI animation and of course a great tune, The new Chemical Brothers new music video is here, and is certainly one to watch! 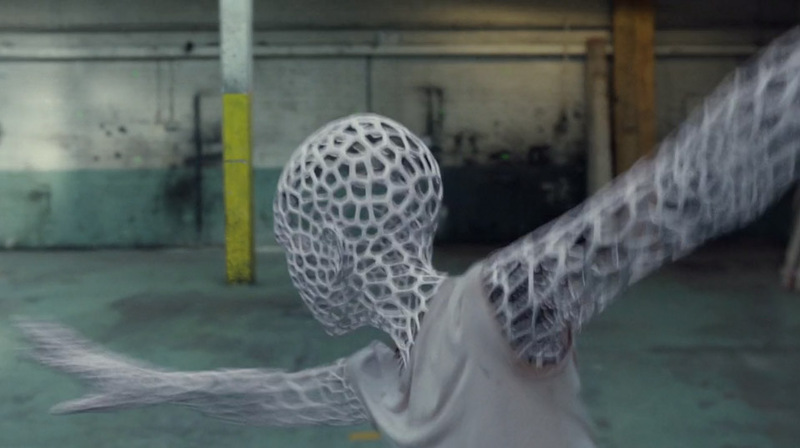 The video features a dancer, who gradually transforms into a 3D printed exoskeleton. It’s a superb video, beautifully choreographed, animated and produced! As a CGI and 3D printing enthusiast, the video really grabs my attention. I’m not exactly sure how the video and CGI were produced. My thinking and logic would be that the dancer is shot either in front of a green screen, or in the warehouse, and then the warehouse is in fact either entirely CGI, or a mix of real and CGI. Markers on the dancers body may also have be used to track the dancer, and allow the animators to sync the footage of the girl with the computer generated exoskeleton. No matter how it’s done, it’s no easy job!! The visual appearance of the exoskeleton reminds me of Cortex Exoskeleton, which was designed to replace the traditional cast for broken bones. This style of 3D form has also been used in films, architecture and product design, and is a fascinating mix of organic and rigid shapes. Towards the end of the video, the girl is transformed entirely into the mesh form. At this point (and this is my only tiny criticism), the girl / character is entirely CGI, and perhaps the fabric on her t-shirt isn’t quite as natural flowing as it looked previously in the video. I’m being really nit-picky here, but when you work all day with CGI, it’s hard to not be critical, and see the small tiny flaws. I’m still massively impressed with the video though, and I can’t wait to see a VFX breakdown, which according to comments on the Vimeo page, will be with us shortly! One part of the video I love, and had to re-wind several times was the moment the dancer performs in front of the mirror, and behind the dancer we see the reflection of the girl. Are we supposed to be seeing the dancer from the point of view of her self, perhaps as a ghost, or something more spiritual? The video is already amazing, and throwing in these little things is never a bad thing!! And here is the full video! Turn up the volume, go full screen, and enjoy! 3D printed miniatures aren't just miniature!